Year-round ghost tours, plus the Queen Mary Dark Harbor every Halloween. The former cruise liner, now a floating hotel, features several supernaturally-themed tours throughout the year. During the day there is Haunted Encounters, which invites the curious to explore the ship and hear stories of actual ghost sightings. Ghosts & Legends, presented as a paranormal tour, is actually a special effects scare show, with simulated supernatural phenomenon. After the sun sets, there is a trio of events known as "Attractions at Night: Twilight Aboard the Queen Mary." Paranormal Ship Walk is a longer (two-hour) version of the daytime Haunted Encounters tour, exploring haunted hot spots and divulging the history behind them. Dining with the Spirits gives groups of ten guests a fine dining experience in the Winston Churchill restaurant before they embark on the haunted history tour. Paranormal Investigation takes ghost hunters on an allegedly real search for supernatural activity in the Queen Mary's haunted depths, hosted by ParaXplorer Project founder Matthew Schulz; this three-hour tour is regularly scheduled on weekends, but it can be booked during the week. 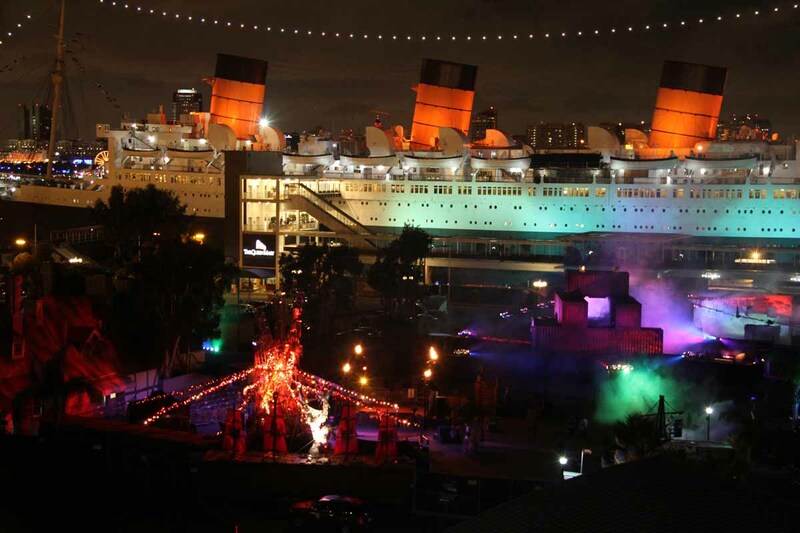 Every October, the hotel dresses up for the Queen Mary Dark Harbor, a month-long Halloween event featuring walk-through mazes, scare zones, and live entertainment. Scroll down for a list of upcoming events. For articles about past events, visit our Queen Mary Archive.